GRAND STAIRCASE-ESCALANTE NATIONAL MONUMENT—In a vast, desolate section of the Southern Utah desert, two magnificent natural passageways sit hidden below the surface a half-mile from each other: Peek-A-Boo and Spooky gulches. When linked together, these slot canyons make for a day hike into the depths of a desert underworld that will captivate even the most seasoned adventurer. The walls of these twisted sandstone corridors are so tall and wavy, only a slight void high above you allows light in. Once you enter, the splendor around every turn is contagious, alluring you onward. These particular slots are narrow enough to touch both walls with your outstretched hands, sometimes getting as narrow as shoulder width. As you shuffle through, each curve reveals fragmented slivers of light whose flickering patterns radiate the underworld and brighten up the rather eerie feeling of being deep underground. 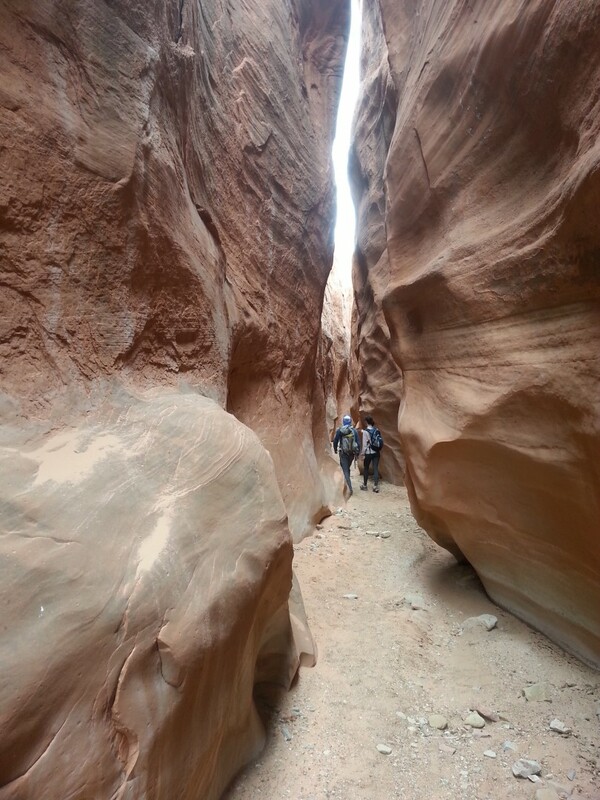 As far as slot canyons go, these two are easily accessible. You can drive to the trailhead, and from there, a 15-minute stomp down a hill and through a wash – Dry Fork Wash – and you’ve reached the first canyon: Peek-A-Boo Gulch. Although only about 3.5 miles long, this loop hike can take the better part of a day considering all the scrambling, shuffling, and maneuvering. It’s more like exploring an adult sized play-place then a traditional hike. You can tour these slots however you’d like but the quickest route, after a 15-minute hike from the trailhead to the entrance of Peek-A-Boo is, in essence, a loop that is, in actuality, shaped more like a square. 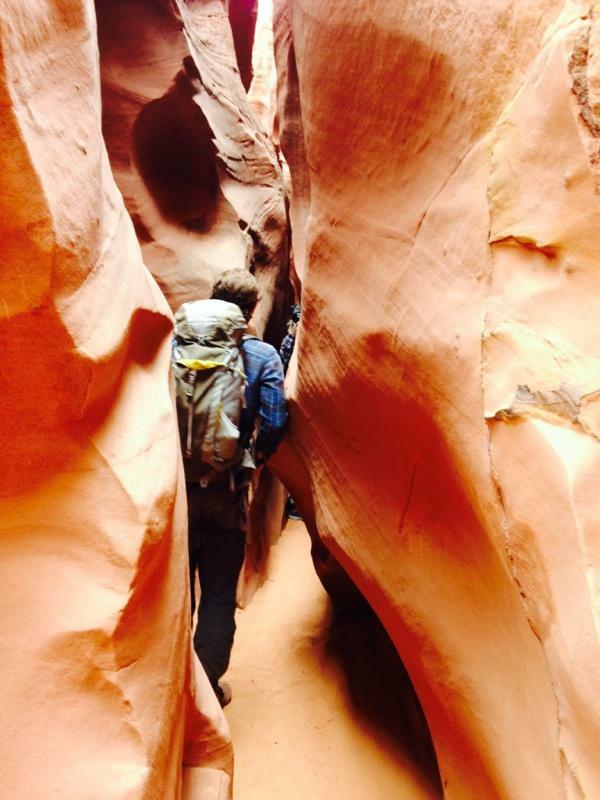 Start by ascending Peek-A-Boo, a gradually inclining slot canyon. Once the walls of the canyon shallow out, turn right; hike cross-country to Spooky Gulch, then descend Spooky which runs parallel to Peek-A-Boo. At the mouth of Spooky hike back past the entrance of Peek-A-Boo, and back to the trailhead. Using steps carved into the slope, scramble up the 15-foot lip at the entrance of Peek-A-Boo, and gasp at the teardrop shaped double arch that welcomes visitors to the magical canyon. There is a possible hot-tub sized pothole that is full of water sometimes right before the double arch. You can usually maneuver this pothole with some minor rock climbing skills, but if not, there’s nothing wrong with getting a little wet. Once you’re through the double arch, you’ve completed the most difficult section of Peek-A-Boo, however there are some minor obstacles ahead. The twisting canyon walls stand about five-stories high, but the width fluctuates with every twist from about 10-feet wide to 3-feet wide. You will shuffle, scramble and rock hop gradually up the canyon which widens slightly after about 1/4 mile. After 2/3 of a mile – approximately 45 minutes of hiking – the walls become shallow enough to hike out of the right side of the canyon. Although you can continue up the canyon to explore more of it, this is the traditional exit point. Catch as much crisp air as you can while hiking cross-country for a about 1/2 mile along a heavily traveled trail, marked with cairns (little stacks of rocks). The trail descends into a highway-sized wash at the top of Spooky Gulch. Turn right (south) and enter this sandy wash which is your path into Spooky. The wash narrows at which point you start an abrupt down-climb through some boulders wedged into the canyon walls. The 1/3 mile long slot section begins at the boulders, which mark the most difficult section of the canyon. This section takes some minor climbing skills – this time climbing down – to maneuver two 10-foot drops. Like walking through a reverse funnel, Spooky starts very narrow from this direction – only slightly wider then your chest in some spots – and gradually widens but never much wider then your outstretched hands. Five adults of all different shapes and sizes fit through recently, and no one ever felt remotely close to getting stuck. That being said, the canyon can feel claustrophobic to some. Also, a lot of sideways shuffling is needed to get through the canyon. As you descend, the canyon becomes gradually wider and for most of the second half you can hike straight through without shuffling. Spooky is deeper and darker with more drastically wavy, twisted walls then Peek-A-Boo. Also Spooky has coarser walls, speckled with dime sized protrusions that are very rough on your clothing. From Hole-In-The-Rock Road, just east on Highway 12 of the town of Escalante, drive 26 miles south on the well-groomed gravel road. Note: There are several sand patches that may be impassable when wet. Turn left onto Dry Fork Road (more of an ATV path then a road). Shortly thereafter stay left at the fork. Follow Dry Fork road for a short distance until it deadends at the Dry Fork Trailhead, which is a high vantage point overlooking the valley to the north where both of these slots are located. This review is not meant to be your guide. If you’re a first time slot explorer you need to learn mapping skills, and self-rescue skills. 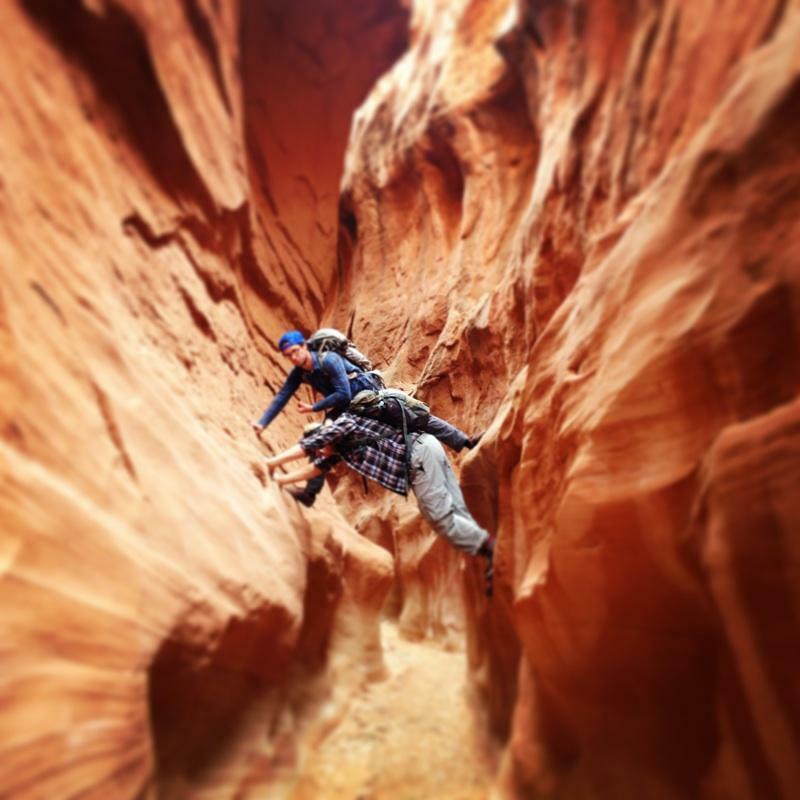 Although these specific slot canyons do not require technical rope skills, it is recommended to have someone along who knows backcountry rescue techniques in case they are needed. These slots are in an extremely isolated part of Utah. 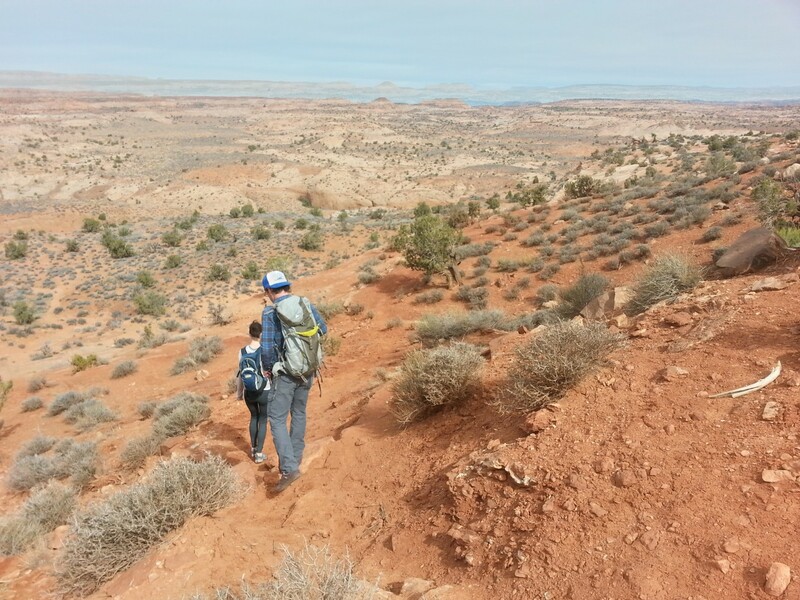 There is no cell service for over 30 miles once you leave Escalante, and typically no water anywhere in the area. Stop at the Bureau of Land Management office in Escalante, 755 W. Main, and purchase a map and get weather updates before leaving the pavement. Bring more water and food than you think you need and preplan scenarios in which you might get stuck in the desert for the night. 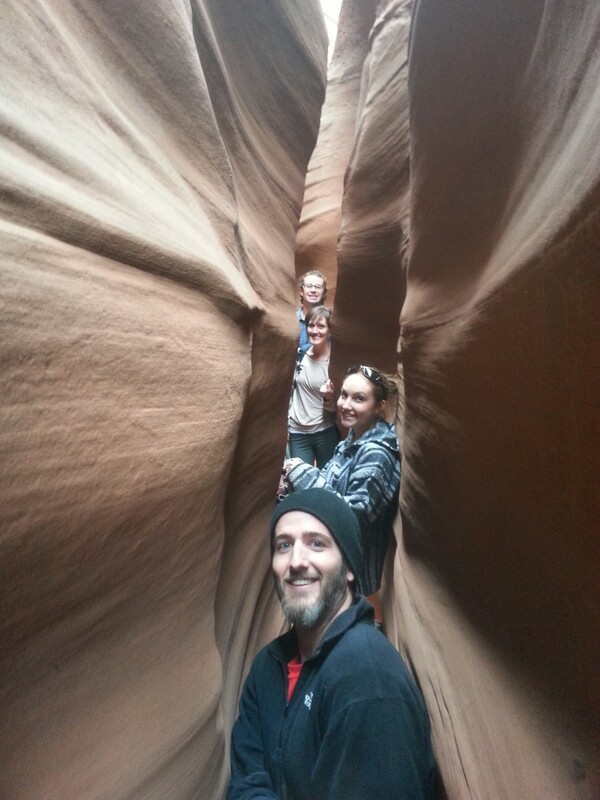 WARNING: Slot canyons are notoriously dangerous. Distant rainstorms can cause flash floods even if the sky is blue above the canyon. After flash floods pass through the canyon, there can be boulders, trees and piles of sand that weren’t there before and the canyon may be impassable. Many injuries in slots occur from unnecessarily jumping off obstacles. Do everything you can to refrain from jumping. A twisted ankle in this desolate, isolated section of desert could result in serious problems. You mean “My mistake. Correction made.” 🙂 Just playing. You’re doing a good job. A punctuation error is a lesser offense than a loosely constructed sentence. Why not fix the whole thing? Original: After flash floods pass through the canyon, there can be boulders, trees and piles of sand that weren’t there before and the canyon may be impassable. Revision: Flooding can bring obstructions, including boulders, trees, and sand, that may make the canyon impassable. Dude, your re-jiggered sentence is tight like a tiger! Great story. Please keep up the good work. I love the slot canyons. Not so much so, the self aggrandized grammar police. Go ahead and flame away little people. Drewbis! You are the consummate outdoorsy-type guy/news writer! Good job on the article and great pitchers! I know how to spell “pictures,” I just wanted to see how many people correct me. We miss you and Josh on the trails at Green Valley!